Are you tired of working with a 1990s style user interface? Hy.ly CRM has been designed ground up to be simple and intuitive for the agent. Agents start with a visual pipeline with just the right indicators to help them focus on actions that matter the most. Use intuitive drag & drop to move prospects through stages. Or, celebrate a lease by dropping the prospect to the Leased bucket below. Make sure nothing falls through the cracks. 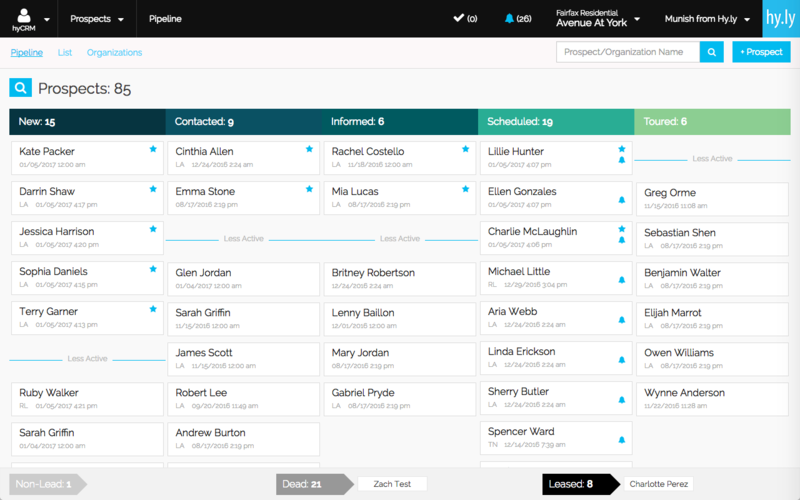 Smart Focus technology automatically stores your active leads on top of the pipeline. A Notification Board keeps tasks and alerts at your fingertips.